Presed by new threats on the Line of Control (LoC), the Indian Army is acquiring sniper rifles which have been used by allied forces in the wars in Afghanistan and Iraq. These are the Italian Beretta .338 Lapua Magnum Scorpio TGT and the American Barrett M95. The procurement of an estimated 5,719 of these sniper rifles has been fast tracked on account of the Indian Army being repeatedly targeted by Pakistani snipers on the LoC. The Italian Beretta Lapua Magnum and the American Barrett M95 will replace the ageing Soviet-origin Dragonov sniper rifles in the Indian inventory. These will scale up the Indian capability to counter the threat on the LoC. SP’s Land Forces had reported the announcement on the new sniper rifles by the Indian Army Chief General Bipin Rawat at a press conference in New Delhi on January 10. But the General did not then specify the make of the guns. The specifics were confirmed later by Army sources. The Northern Command is getting the first lot of these guns as an emergency purchase from special funds delegated to Army Commanders. “These will arrive by January 20,” General Rawat announced. “The balance 5,000 guns (for equipping Infantry and special units other than those in Kashmir) will come under a capital acquisitions programme,” he elaborated. General Rawat described these rifles as “amongst the best in the world”. The Barrett M95 is also used as an anti-materials rifle (AMR), in the role of a bunker buster to target enemies holed up behind fortified defences. This .50 calibre weapon has a kill range of 1,800 metres, and will supplement the Indian Army’s Denel AMR’s acquired from South Africa post the Kargil War in 1999. The procurement of an estimated 5,719 of these sniper rifles has been fast tracked on account of the Indian Army being repeatedly targeted by Pakistani snipers on the LoC. General Rawat made this announcement in the context of putting the Infantry foot soldier at the heart of the Army’s procurement agenda. Many other big ticket programmes including the Battlefield Management System and Tactical Communication System have been dropped. Even the ambitious FINSAS programme itself has been reduced to acquiring a good assault rifle and carbine for the Infantry, and protective gear like helmets and bullet proof jackets. “Things have changed. It’s time for a relook. The equipment used by the US Army is not our requirement. 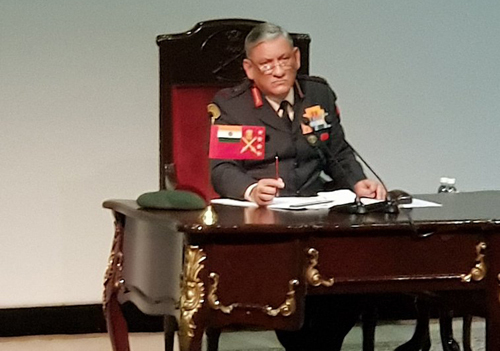 We are modifying our requirement,” General Rawat said, while responding to a question by SP’s editor-in-chief on the rationale for dropping major programmes. SP’s Land Forces also reported on January 10 the Army Chief’s announcement of the selection of Sig Sauer SiG 716 assault rifle and Caracal carbine to replace the INSAS and the 9mm Sterling respectively. The new assault rifles will start coming in this year, as also more Bullet-proof jackets, helmets and software defined radios. General Rawat also made a mention of tactical surveillance drones for Infantry battalions. Hand-launched UAVs have been purchased for forward deployed units from Army Commanders’ funds.